Young woman's face before a microdermabrasion treatment. Microdermabrasion treatments are a lot more comfortable, gentle and safe for the client due to the diamond hand piece most professionals use these days. The diamond tip has a slightly abrasive surface which helps to gently sand away dead skin cells while suctioning them off right away. It helps to improve uneven skin tone and texture and to rejuvenate the skin. The old versions use crystals which are made of aluminum oxide. However, with increasing suspicion of a link between aluminum and Alzheimer's disease, the microdermabrasion crystals are no longer your best choice. Microderm produces great results. The skin may be slightly red for a short period of time afterwards, but there's no recovery time needed. It is a safe procedure suitable for most skin types and colour. It is gentle enough that it is still considered a noninvasive treatment. 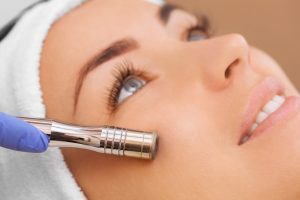 What Happens After The Microdermabrasion Treatment? Use gentle skin care products and apply a moisturizer every day. Do not use topical acne medications for a day or two after the treatment. Wear a sunscreen every day to protect your skin. Your skin might become more sensitive to the sun after few weeks of treatments. Generally speaking, the number of treatments required vary from 6 - 12 sessions due to the fact that microdermabrasion exfoliates only the thin outer layer of the skin. It will also depend on the condition of your skin and what results you are looking for. It is a good idea to have a facial at least every three months to keep up with your maintenance. At L'Exquisite we do not offer stand alone microdermabrasion treatments. We incorporate microdermabrasion with some of our facials to give you the absolute best results.